Today was the final day of the 30 day Equi-Heart Pledge! Together with you, I just completed a 30 day cycle of tuning into the Wisdom of Horse once a day in a Global Heart Experiment with Horse! YAY! I experienced so many ah-ha's and awakening moments, plus had a real breakthrough towards the end which is catapulting me forward on the next phase of my journey of service with horse. How to celebrate such an ending? Well, of course, the horses had a splendid idea! With a Circle of Life Ritual- releasing what no longer serves and calling in that which we wish to embody. How will you BE THE MAGIC in your life? What are you ready to release and eager to reclaim? Walk your own Circle of Life and let me know what you notice! Or try the Journey Ride Meditation- it's essentially a 55 min guided Circle of Life meditation with Horse! Download yours for only $9.95 here. THANK YOU for joining me for this 30 day equine extravaganza of healing, wisdom, and inspiration! I'd love to hear from you about your experience during our global heart experiment. 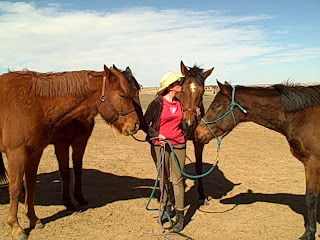 PLEASE SEND me your story at drjenn@unitywithhorse.com and a pic, I'll post it here and on our Dorothy Moments with Horse Book Blog. I'm eager to hear how Horse touched YOU! During this month, I also discovered that this was a LOT of wisdom to try to integrate in only 30 days!!! Just when I had a new Gem to practice, it was time to move onto the next! So to help myself and others really embody and integrate the healing messages of horse, I'm going to be putting together a new program called The Wisdom Horse Way- an e- workbook, with audio exercises, plus videos to guide all of us in living the Wisdom of Horse! If you are on our list, you'll get the updates when this new program is ready! May you remember that the Heart of Horse is always just a breath away! Today and all days, may Horse be with you. Sending you horse-hearted blessings for a life filled with love!